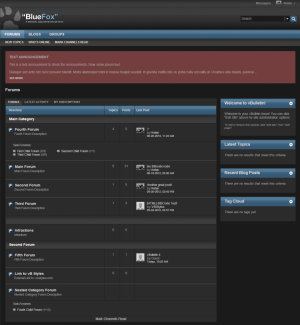 VB Styles Provides Premium vBulletin Skins and Themes For Your vBulletin Forums! All vBulletin Skins come with 1 year of free support and fast vBulletin updates for $34.99 only. Please click on 'View All Styles' to see all styles we have or navigate between different styles using left and right green arrows. All Styles come with 1 Year of free upgrades for newer vBulletin releases. With vBulletin releasing new versions so often, it is critical to choose vBStyles as your style provider since we provide style updates faster (usually with in few days after release). vBStyles takes great pride in providing outstanding customer service. We don't just talk, we deliver. With the support we provide, you will be glad you chose us. vBStyles makes sure you get the best of the best Style at very reasonable price. Our pixel perfect styles with custom icons are available for only $34.99. vBStyles is one of the oldest vBulletin Styles provider. We have been around since 2003 and that shows our commitment to serve customers like you. You may be looking for customizing the existing vBulletin Style or one of the styles you like on our site. We are here to help. vBStyles offers affordable custom vBulletin skins, please check us out.